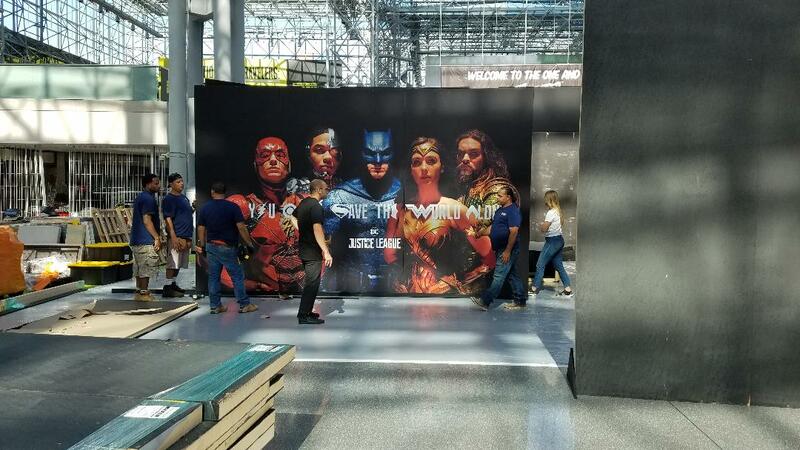 Justice League is coming to New York Comic Con and we have a first look! Steven Biscotti sent us these photos (thank you), as crews set up the display at the Javits Center in Midtown Manhattan today. 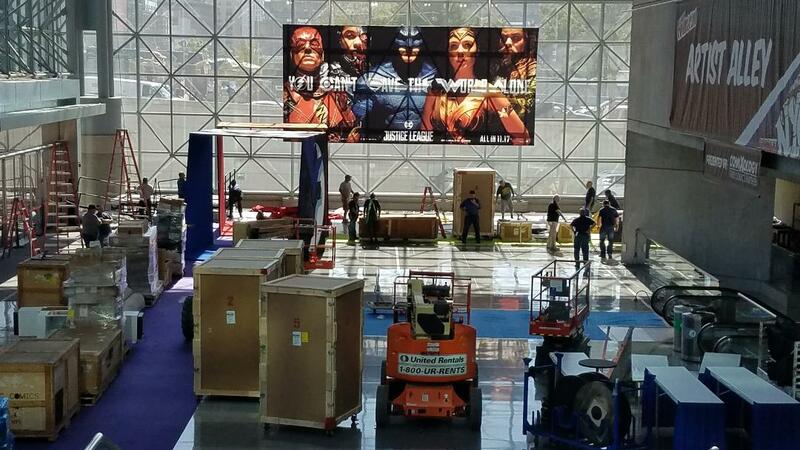 NYCC starts Thursday, and we'll be there to bring you coverage on everything related to the film. Here is the complete DC schedule. More to come! Do we know for certain that Henry/Superman is in JL? He has not been featured in any of the promo stuff and the date is getting late. With WW getting a sequel in 2019 and Flashpoint and JL Dark announced it looks like there will be no more stand alone Superman films? At least not for a long while and by then Henry will have moved on. I've been out of the loop for a while - can someone tell me what is going on? Answered below :) Go Supes! The thing that bothers me, aside from no sight of Henry in any promo material, is that the cast appearances so far, that I've seen, have been the "5" (sans Henry) or Affleck and Gadot paired. I was looking forward to seeing Henry with the others in some of the late night and daytime entertainment shows just before the film's release. Not sure if that will happen. Henry seems to be getting back burned - guess it's better than Snyder's fate who got totally burned. As far as we know Superman is in the film. But it's a small role. Rumor is Eisenberg/Lex has been cut. WB wasn't happy with MOS or BvS and are distancing themselves from those films. WW is now ahead of Batman as WB's crown jewel as new JL images show - she is at the center. There is worry about JL and JL2 is not a given. It may be dropped as with WW2 and FP and SS2 and Batman and other films WB needs the JL2 2019 slot. WB is dropping the tied universe. WW was a true standalone and WB's biggest domestic film ever. Aquaman 2018 is emphasizing it will be a standalone. One reason WB may drop JL2. Vaughn has said there have been some talks about a Superman film. It is way off and Collider reports if it happens there will be a new Superman actor. There is a fair chance JL will be Henry's last Superman outing. Alright, let's not get sidetracked here. Anonymous @ 10:17 Henry is in the film, no need to worry. Anonymous @ 11:26 no one is getting back burned... you'll see. Finally anonymous @ 2:57, most definitely not a small role. Just wait! Thanks. Still it looks like Henry will be in few if any of the public appearances leading up to the film next month. I don't get that. There is a point in being coy but come on now. No way Henry signed off on that! Collider's report that a new actor will be cast for an eventual Superman film is unfortunate. Especially if JL2 is canned. Hope you are right his role will be important in JL as that may be his last outing if JL2 gets axed. It's unfortunate MOS didn't have a different writer and director - and my thoughts go out to Zach Snyder on his loss. Geoff Johns it was just reported had big problems with the neck snap in MOS but no one listened. That Johns is letting this out now tells me WB realizes it made a huge mistake with MOS. Now Johns has a pivotal role in future WB DC films which is good. But another Superman film is years away so who knows. It is understandable that, if WB green lights another Superman film, they will want it to have no connection with MOS or BvS. Cavill, as part of those films, will not be cast as Superman. It's a business decision - one I would make if I were in WB's place. Cavill will now be moving on from WB/DC after JL and that is great for his career! FYI, after the massive success of WW, JL2 is morphing into Flashpoint 2019 per industry sources. A Flash centric film with Bats and WW as co-stars. Not a full on JL film. That gives WB the slot they need for WW2 in 2019 to follow up on her huge box. Talk of a billion worldwide next time for her. Is the entire cast going to be in NYC this weekend? From what is being reported Henry will not be there. My point about it is that is long past being coy. Superman related characters have recently been cut from the film per rumors. Lex of all people. The change in direction by WB after the success of WW seems to be driving JL to be the end of an aborted DC-uverse. Going forward it will be standalone films. Henry's and Amy's parts are being cut probably as we write. Saying a lot as by all accounts they were small to begin with. Actually, more Superman was added during reshoots and again by no means is Henry's role small. Like Gal said at SDCC, Supes' fans will be more than pleased. Look at the contracts. Gadot upped for 3 more films w/in a month of the WW debut Six films total. Henry - no movement beyond his 3 pic deal at more than 3 years after the MOS debut. The handwriting is pretty obvious. I expect WB and Henry will announce, a month or two after the JL release, that they are parting ways. Really, it's a win/win for both. Variety and others reporting more Superman cuts. Lex may be out. Adams reduced. Flashpoint has replaced JL2 for 2019. Flash fans are not happy about it as WW and Bats will be featured and the fear is it will turn into a film about DC's "power couple" and not about the Flash. Setting the stage for the rumored Bats/WW film in 2021. The failure to include Henry in the JL promotions is criminal. Do you realize how important promos are for actors? Their bread and butter. WB is clearly playing hardball and that speaks all one need s to know about them. Henry is on contract though JL - I can't wait to hear what he says after the film. He has been treated like dirt by WB and, though he will say so in a stiff upper lift fashion, he will let fans know. I hope he announces his departure prior to the "planned" announcement as rumored. He owes nothing to WB. I think you're over reacting a little bit here. Frankly, I'm not expecting Henry to be in much of the promo. One of the biggest mysteries for the movie is how will Superman return. So with that, I can see them keeping him the background for the time being. The interview rounds haven't begun yet so it's yet to be seen how much Henry will be involved on those. We do know he's participating in that event AFTER the movie is out. He'll be able to actually talk about Superman's return during that. He really can't say anything now without giving away anything. This reminds me a lot of the last Star Wars movie. Mark Hamill (Luke Skywalker) was in very little of the promo. While I do agree that Henry/Superman hasn't always been treated the best, I think some just need to take a deep breath and see how this pans out. Frankly, I'll see this movie, but if they cut Superman/Henry out of future movies, I won't be wasting my money on any of those movies.